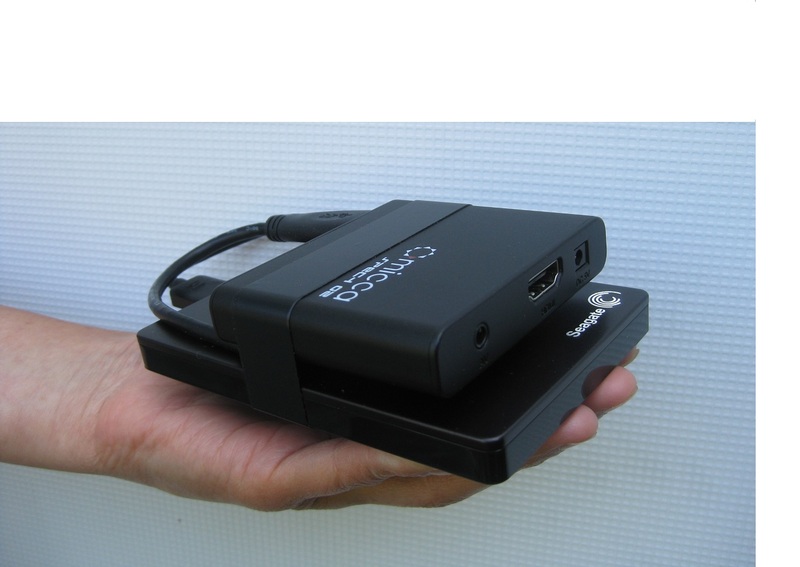 The entire mediaseva library in a box, playable on any TV. Mediaseva has compressed it's entire archive of Satsangs, Bhajans and publications (English and Spanish) into a small media player that connects to any standard TV, just like a VCR or DVD player. Each TV Collection unit comes with a remote control and HDMI cable, ready to connect to your flat-screen TV. The video and audio content itself is free. The prices below reflect the cost of the components plus packaging, paid by cash or check. Prices may go up or down without notice. We'll confirm the current price by email. If you have a TVC and need to check which Satsangs or other material you are missing, consult the Mediaseva Catalog. files with a computer. With two clicks, it uses a WiFi or Ethernet connection to update itself with the latest files. 50% larger hard disk accommodates many years of new Satsangs. 3TB capacity. Displays the Live Broadcasts from Delhi. It's preset to the Livestream SantMat channel. No need for a computer. 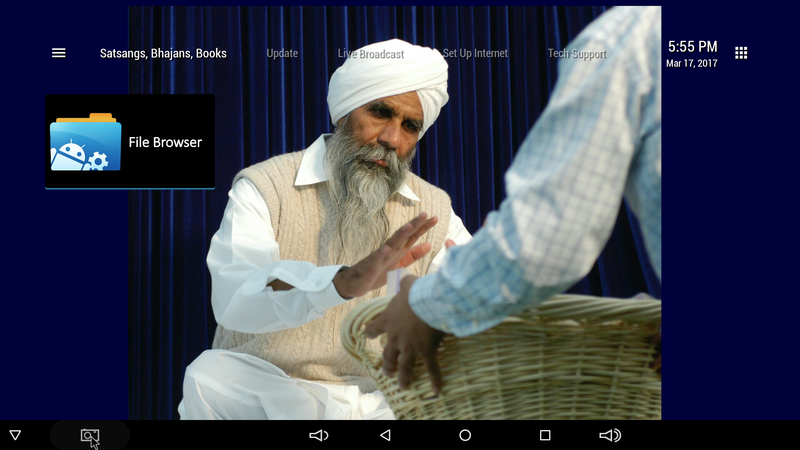 The Acrobat reader displays full-screen the new Bhajan book plus the library of books and magazines of Sant Mat. 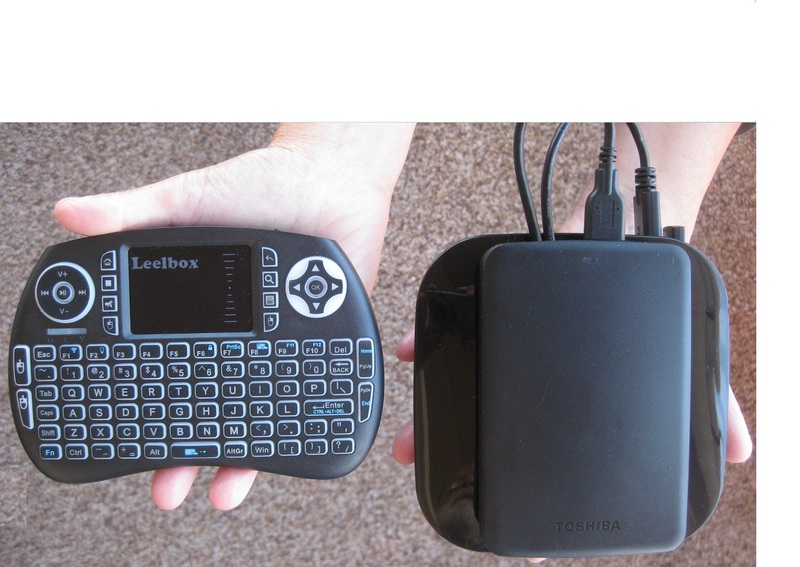 A handy mini-keyboard makes access to the live broadcast and other functions easier. 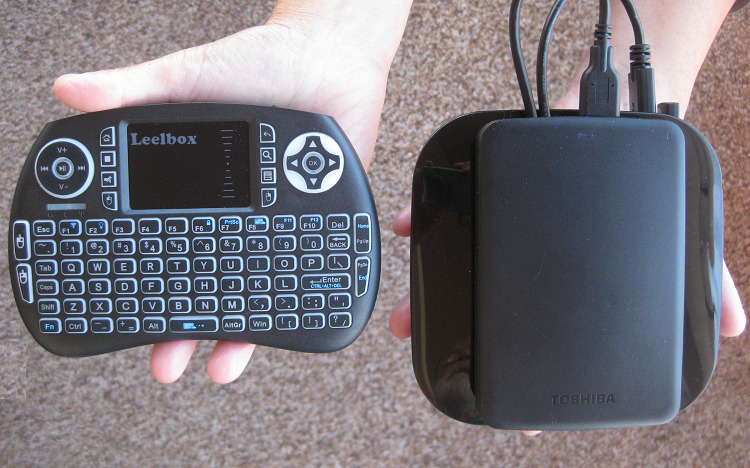 USB Powered Hub increases reliability, supports future expansion and charges the mini-keyboard. Click the TVC Guide which explains the quick setup, main menu, and useful operating tips. It comes with each TVC. Remote Tech Support lets a mediaseva sevadar remote into the TVC to fix problems or add features. Please arrow down to the bottom of the page to see a larger photo of the Complete TVC. You need to wait for the announcement before using the automatic update feature, so that the server can be updated. If you have very slow internet, we recommend that you use the Micca unit instead (option N.2), which can be loaded as a complete TV Collection. Do NOT connect the hard drive to a Mac. This unit is designed for internet use and updates. If for some reason you need to update it with a computer, it must be a PC because Macs will erase the hard drive. Read and follow all the installation instructions carefully. If you are not technical, have some one help you connect your new TVC. A note on Hi Def video: Since April of 2007, mediaseva has recorded many programs in High-Definition (1080P) video. The quality is noticeably better than DVD. This HD program material looks best on a widescreen monitor or High-Def TV capable of playing 720P, 1080i or 1080P video. For videos made before 2007, and later programs recorded in Standard Def, Standard Def videos are very satisfactory for most viewers. This unit (Micca Speck) has a 2TB drive that stores only Satsangs that include Spanish translation. It also includes all the Bhajans, photos, and Spanish publications from the Sant Mat Castellano collection for Spanish speakers. The Micca unit comes with a basic remote control, HDMI cable, plus composite video/audio cable for connection to older TVs. The Micca can play media files stored on SD cards, which are common. This unit is updated with new Satsangs by connecting it to a computer, creating a new folder, then downloading the files into it. It can't update itself automatically, as the Complete unit can. Please arrow down to the bottom of the page to see a larger photo of this Español unit. This is NOT a full TVC, just a hard drive. No Bhajans, books or photos. Only past Masters' Satsangs. Some Dear Ones requested to view the older videos of Sant Ji, Baba Somanath, Baba Sawan Singh and Sant Kirpal Singh Ji with the maximum possible quality. To accomodate this, we have put the files of every single DVD (880 total) of these Past Masters on a 3TB desktop external hard drive. This unit can be connected to a	computer, which can play any of the Satsangs stored on the drive. This drive includes ONLY videos that are NOT compressed (as they are in options 1 and 2 above,), that is, they are full DVD resolution. If you have a high quality flat-screen TV, you will notice improved video clarity on all the older videos. The files on this hard disk are set up and ready to burn to your own recordable DVDs if you wish. We can copy the contents of the TV Collections described in options 1 or 2 onto a 3TB hard drive. This can save money if you just want to play this collection on a computer, or connect it to a media player box on your own. You can also connect your drive to a smart TV, and browse the contents using your remote. You can also mail us your own drive if you prefer. You need at least a 3TB drive to store the data and provide room for updates, which you do manually with a computer. Email mediaseva if you want us to load your drive. Our suppliers offer a thirty-day replacement policy. If we find defects when we test the components, we contact the supplier to remedy the problem quickly. After 30 days, however, when the components are covered by their manufacturer's warranties, mediaseva does not have the capability to make repairs and/or handle warranty claims. Each manufacturer's warranty documentation will be provided with your unit. To make a warranty claim, you need to contact the manufacturer directly and ship either the player or the hard drive to them. If your hard disk fails and the manufacturer replaces it, we will be happy to reload your new drive at no charge. you pay only the cost of shipping it back to you. 1) Which unit you wish to order (Complete, Español, Past Masters, Hard Drive Only). 3) The shipping address the package should be sent to. Signature will be required upon delivery. 4) Your telephone number and e-mail address. Do not send payment before your order is confirmed!! Prices for electronics and international shipping can change quickly. mediaseva will confirm your order and give you payment details. We will confirm receipt of your payment and then order the components from our supplier. When the parts arrive here, we will assemble, load and test the unit, then ship it. Signature will be required upon delivery. It can take two to three weeks from the date we confirm your payment until we ship your order. If your country is not listed, please contact us via e-mail and we will get a rate for you. Shipping charges can change at any time, so we will confirm the rates quoted below before requesting an exact total payment. If you have a friend or relative who will be traveling between the USA and your location, we are happy to ship to them in the US, since this will provide a large savings. MEXICO: $95 via insured FedEx International Economy. ITALY, FRANCE, GERMANY & U.K.: $110 via insured FedEx International Economy. SPAIN, INDIA, HONG KONG, THAILAND, AUSTRALIA & NEW ZEALAND: $120 via insured FedEx International Economy. COLOMBIA, ECUADOR, S.AFRICA & GHANA: $188 via insured FedEx International Economy. Newer videos are full 1080P High Definition quality. Older videos are compressed from the original DVDs. This means that video quality is not quite as sharp and clear as watching a DVD on an excellent TV or computer monitor. On a standard TV, at normal viewing distance, most people will not notice a difference between the DVDs and a Standard Def video playing on a TV Collection box. In all cases, audio quality is as good as the original recording. The Complete TV Collection can update itself automatically via an internet connection. All other units must be connected to a computer, and you use a web browser or FTP client to download free files from our website. Details can be found by clicking the New Downloads tab. If you need to check which Satsangs or other material you are missing in your TVC, consult the Mediaseva Catalog. Using a simple wireless remote control, you can browse and select from the complete library of video content, sorted by Master, year, location of the program, and date. You can also play all the Bhajans and view many still pictures of the Masters. The TV Collection player works more like a VHS tape player than a DVD player. There are no menus or chapters for each video. When you select a video to play, it starts from the beginning and plays through to the end, and you can fast-forward, rewind, pause and stop, just as a VCR does. You can also view the videos on your computer, since the player contains a hard disk with a common USB computer connection. 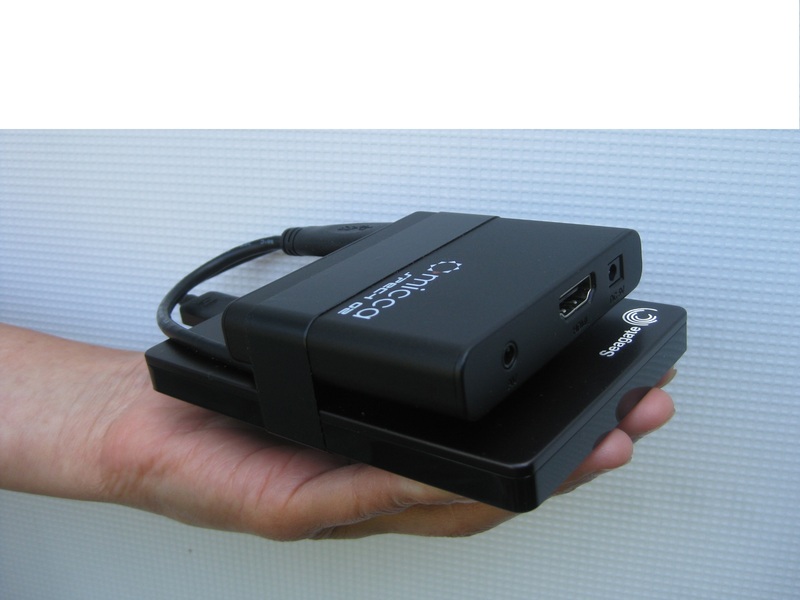 Many people have laptops, so this can be handy if you are away from home or if you don't have a larger TV. If you want to view the High Definition Satsangs on your computer, it must be a faster machine with at least a dual-core processor, otherwise the video will not play smoothly. The files are encoded to the US NTSC TV standard, just like the DVDs. Since most European TVs will play NTSC content as well as the European PAL standard, there should be no problem with compatibility, unless the PAL TV is very old. The TV Collection units offer composite and HDMI signals for your TV. These are world-wide standards, so there should be no connection problems. Hard drives only come with a USB connection. Check this page for updates and latest news regarding the TV Collections. If your country is not listed, please contact us via e-mail and we will get a rate for you. If you have a friend or relative who will be traveling between the USA and your country, we are happy to ship to them in the US, since this will provide huge savings. USA: $20 via insured USPS.